Me: Hi, can I order a zucchini? Grocery man: No, don’t have. You want courgette? Grocery man: No, don’t have. Have baby marrow. Me: Huh? What? (Then remember baby marrow is a local vegetable that is kind of zucchini-ish). Oh ok, I’ll try that. Grocery man: Wait, we have in yellow. Me: What? The baby marrow? Grocery Man: No, zucchini. You come look. After arriving at the store, of course there are about 50 zucchinis on the shelf. I actually found the man I spoke to earlier and informed him, only to have him say: Ohhh, you want Za-co-ni. Why you not say before? Normally I would have been amused at this whole exchange. Living here has taught me patience, an invaluable virtue to have, especially for raising two crazy boys. But today I was just not in the mood. In fact, this ordeal made me feel kind of homesick. So instead of making my farfalle with zucchini ribbons as initially planned, I decided to make some zucchini bread. It’s delicious and something I haven’t seen anywhere but in the U.S. and reminded me a bit of home. 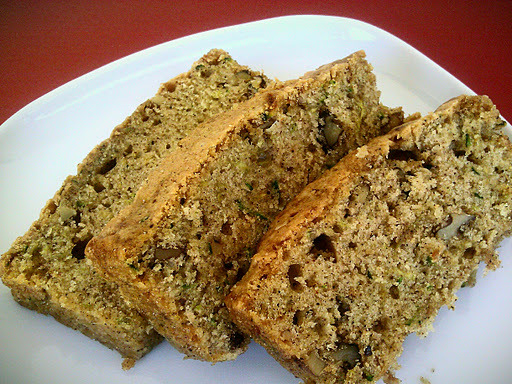 This entry was posted in Desserts, Vegetarian and tagged Vegetarian, zucchini bread by thepantrydiva. Bookmark the permalink. Haha! Love it. The saying is truly apt though. You are so right about this. I often say 'in Dubai anything is possible, but doing it can be very difficult'.